Love pockets? This fun little top is for you! It has our signature loose cowl, an easy shape with 6" comfort slits and a fabulous buttoned pocket that drops below the hemline to keep your smart phone, passport or reading glasses at the ready. 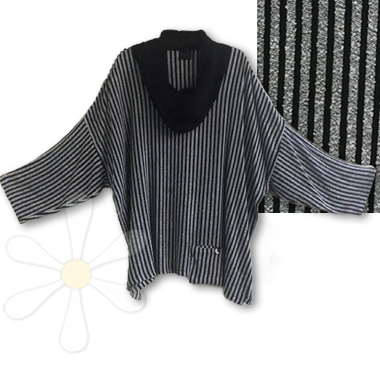 And this one is in our RARE woven boucle stripe sousdi with a contrasting black collar. One of a kind!